Circumnavigating Barcelona by bike is a great experience. You will see the city from different angles but with plenty of nature thrown into the bargain. The Ronda Verde (circular route) combines different bike trails to create an inner and an outer circular bike route around town. 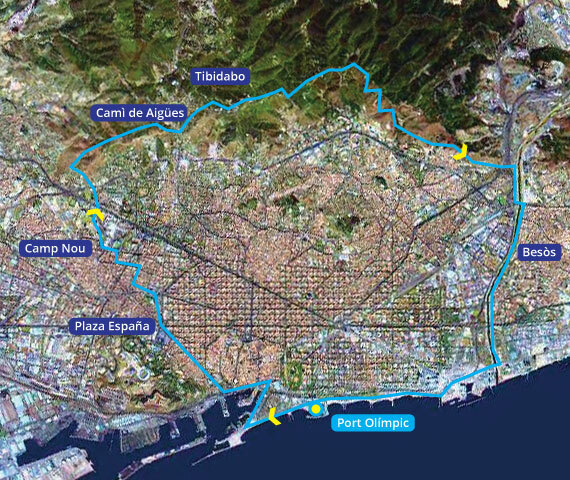 We start cycling at sea level at the Olympic Port, then cycle up to the Collserola mountain range behind Barcelona and along the panoramic gravel road Cami de Aigues until we reach the river Besòs, which borders the metropolis to the north. The final kilometres are an enjoyable ride back along the beach. "Circular Tour…For my son and me it was a perfect day trip in in middle of January. We had the most amazing views and insights! The slightly exhausting, short ascent was quickly forgotten. An insider tip."